Ngong Ping 360 Cable Car is a 25-minute and 5.7 kilometer ride in Hong Kong. It crosses Tung Chung Bay, offering outstanding vistas of the distant and vast South China Sea and the rolling grassland slopes of North Lantau Country Park. 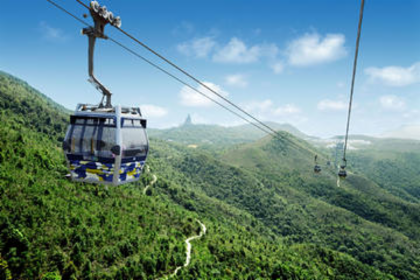 This Cable Car is the best option to reach the area’s top attractions, including the famous Tiantan Buddha in Lantau island, the Po Lin monastery and the giant wooden steles of the Wisdom Path in Ngong Ping Village. In order to access the Cable Car, please show the provided voucher at the ticket office. There you will be able to redeem your voucher for entrance tickets to make the round-trip during the same day.